A collection event on Saturday, May 6, at the North Park Swimming Pool parking lot will provide Pennsylvania residents with the first of six opportunities to safely and cost effectively dispose of common household chemicals in 2017. Throughout the spring, summer and fall, the PRC will hold events in Allegheny, Beaver, Cambria and Washington counties to collect household chemical products known as “household hazardous waste” such as cleaners, paints, stains and varnishes, batteries, motor oil, pesticides and other products containing potentially hazardous chemicals. According to the U.S. Environmental Protection Agency, an average home can easily accumulate 100 pounds of these products. The first PRC drive-thru household chemical collection of 2017 will take place on Saturday, May 6, from 9 a.m. to 1 p.m. at the North Park Swimming Pool parking lot in Allegheny County. The cost to safely dispose of materials at all collections will be $3/gallon (a few exceptions apply), cash only. For information – and a complete list of items accepted – click here or call 412-488-7452. 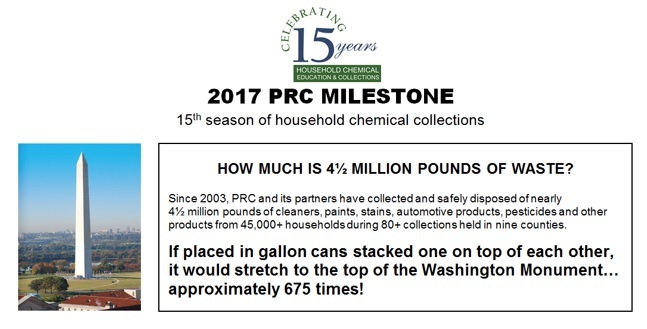 The 2017 household chemical collection campaign is a project of the Pennsylvania Resources Council in conjunction with Allegheny County Health Department, Allegheny County Parks Department, Beaver County Commissioners, Cambria County Solid Waste Authority, Washington County, AAA East Central, Colcom Foundation, UPMC, LANXESS, NOVA Chemicals, PA American Water, PA Department of Environmental Protection, Concurrent Technologies Corporation and NewsRadio 1020 KDKA.